Starring: Ryan Gosling, George Clooney, Philip Seymour Hoffman, Paul Giamatti, Evan Rachel Wood, Marisa Tomei and Jeffrey Wright. 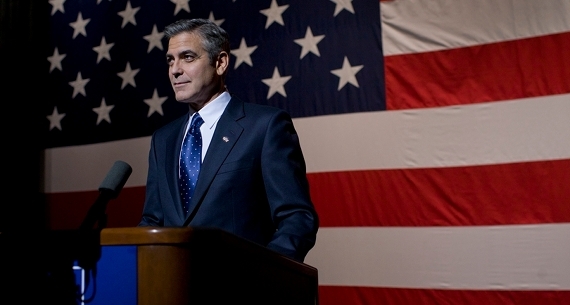 Stephen Meyers (Ryan Gosling) is a campaign manager for Democratic presidential candidate Governor Mike Morris (George Clooney). He is extremely optimistic about Morris' progressive values and says that he will support anything as long as he believes it. Stephen is employed under the watch of Paul (Philip Seymour Hoffman), who values loyalty most and is precariously trying to sway a senator (Jeffrey Wright) for his support so that they can take the crucial state of Ohio. Friction arises when Stephen has talks with rival democrat campaigner Tom Duffy (Paul Giamatti), who wants to hire him and promote his own candidate. This meeting is somehow traced by a hungry reporter in Ida (Marisa Tomei). Meanwhile, Stephen becomes loosely involved with Molly (Evan Rachel Wood), who is also hiding something. 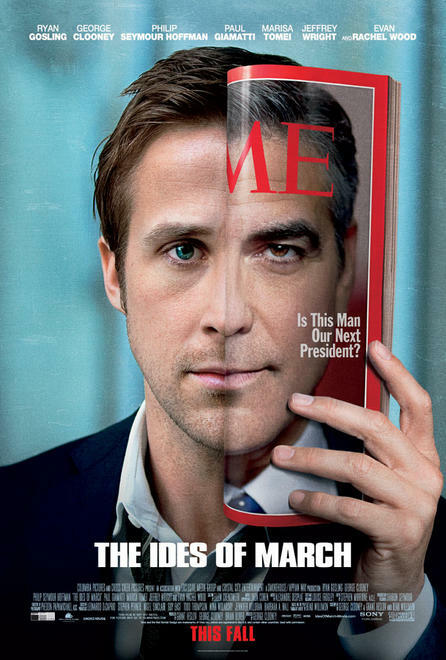 Despite the enormity of the cast, The Ides of March is a modestly produced and tautly written political thriller. It throws us into the deep end of American politics and for outsiders this can be daunting. This is because much of the dialogue in the film, though occasionally witty and funny, is also highly loaded. It is essential to read between the lines here and that leaves us on the outskirts from many of these ambiguous characters. The detail placed on single lines of dialogue remains purposeful and requires our full attention. When Stephen asks how old a character is there are more subtle implications as they suss and test each other out. Accurately, it reminds us of how cautiously people in this domain have to tread in both their public and private lives. The battle is here not fought between conflicting parties of opposition but the single regime of the Democrats. It is ironic to see such infighting because we know they will present a united front to the public come the Presidential election. The facade of the characters is reflected through the film's subtle aesthetic design. Many scenes, such as the opening in a hall and a late confrontation in a restaurant, are cast in deep shadows. It gives the film and the characters a classic noir feel of mistrust and uncertainty. Contrastingly, day time scenes are photographed down long, cold brick corridors or behind panes of glass, contributing a sense of a highly isolated work environment. Towards its script and its design, this is a very delicately made film. Although the start of the film is distancing and cold, a clever twist in the plot sees the narrative hit its straps. From this point the film becomes deeply entrenched with human power plays of loyalty, friendship and expendability. Due to the flawless casting and performances many of the intense confrontations, particularly late in the film, are of the highest order. Gosling has proven that this year that he has the range to not only play any type of role but to sustain his work at such a consistently high and entertaining level. He's exceptional again, with his role closer to the one he played in Half Nelson, as a man who is gradually deteriorating from the inside out. As Stephen's status gradually declines, the apparentness of his fear makes the performance human and compelling. Clooney again finds a way to tap into his own celebrity image because beneath the smiles and sincerity of his character is someone dark and entirely ruthless. The force in both of their performances peaks during a riveting showdown that reaches palpable levels of tension. Giamatti and Hoffman are in fine touch but Evan Rachel Wood holds her own too as the most vulnerable kind of damsel in distress. Closing the film is an ending that is part Shakespearean tragedy, hence the title taken from "Julius Caesar", but also Faust as well. It does not reach a high emotional peak but it's still a straight reminder of how quickly people are willing to sell their own moral and ethical values. We already knew that and it will not change the world but as long as cinema returns to a mature state of reminding us of the failure of human nature, like it does here, we're happy.